So whats the relationship between an angle and its sine? I typed out all the degrees between 0 and 89 into a spread sheet and wrote out the answer then made a graph. Using the mighty powers of excel I got equations for the graph. I had the option of choosing how many polynomials I wanted in my function. These are approx what the sine of 10 or the sine of 58 degrees should actually be. So if my calculator was ever destroyed and my log tables burned I could use this to approximate the sine of any angle. Has anyone studied this? As sine and cos and tan are so prevalent in education systems every website I google is just covering them as buttons or commands or magic spells one presses and the calculator does the action behind the scenes. I wanted to know more about the action but am out of ideas of what to Google. so i know the ratio of the opposite side to the hypotenuse is always 0.5. So any time I come across 30 degrees I can get sine 30; a magical spell that returns 0.5 so I know what to do with the the two sides if I compare them. Is there actually a function that is listed as official definition? What would one do if they had to program a calculator? 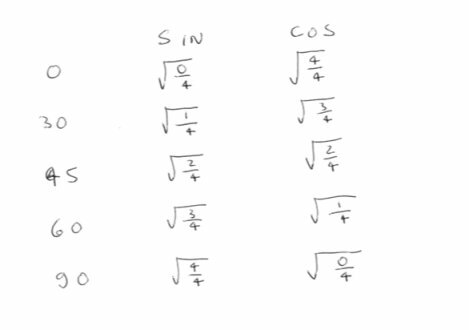 Here is a simple table for basic important angles for sin and cos; tan, of course, is sin/cos. The table values are exact. You can make a more complicated table for multiples of 15 degrees. Remember also that for small angles sinx = tanx = x. Well, what is sin(x) and what is cos(x)for x near zero? Is there a difficulty here? I don't see it. However I apologise for not noting that strictly the angles should be measured in radians to use the small angle approximatuion. However the OP did say without a calculator. Series answers are all very well but get quite hairy quite quickly on say 0.3372986 rads. So I would recommend constructing a table like mine with as many known points as possible and then learning to interpolate. This is, of course, the actual method by which tables were originally constructed and used. Series methods are just too laborious. For 0.3372986 rads the sin x=x approximation is within 2%. If you wanted to know it more accurately, the third order term would help a lot. However most of the entries in your proposed table would be redundant. Or, you could construct the angle (possibly easier said than done) and measure the ratio of the sides of the triangle. So should I edit the post to read 1.3372986 rads? The value was chosen at random. Did you not understand the point I was making? That would make a different set of the values in your table redundant. Incidentally, without a calculator, how do you calculate the square roots in your table? I know it's possible, but it isn't trivial. More interestingly, how do you do the interpolations? Linear interpolation won't be very accurate (unless you are prepared to calculate a lot of square roots). There are two different problems here, and we are each addressing one of them. If you need sin(x) for any one particular value of x then calculating that value is less effort than constructing a table. If, on the other hand, you are going to need the value of sin(x) for many values of x, the table will save you some effort. However, it only makes sense to calculate the values for an eighth of a circle because you can use the trigonometric identities to find the other values. Did you not learn the algebraic procedure for extracting square roots in primary or early secondary school? Its comparable to long division. Which is much much easier than finding the third order coefficient of a seven digit number by hand, as you suggested earlier. Interpolation? Who said linear interpolation? I was referring to at least Newton's forward difference method. As a matter of interest there are many right triangles with integral sides containing the right angle that can yield many way points on the table quite simply. I have seen the longhand method for calculating square roots, but I never learned it. To calculate the third order coefficient I have to multiply 2 by 3 to get 6 and take the reciprocal. What steps are involved in your route? I think it's better to memorize sin 1-89, It'll save you alot of time. Depending on the required precision, one can always sketch the graph real quick and make an estimate. If you employed a lofting draftsman from boatyard I expect he'd be very very good at it. So do the Taylor expansion around another value that's known. "Not using a calculator" is not the same as "not doing math". (Well, maybe that's true of students today, but some of us learned to do this by hand). It's also not specified what the required accuracy is. Doing an expansion may not be as easy as punching the numbers into a keypad, but that wasn't one of the parameters. Indeed, but I'd still like to know how many steps are involved in your method for finding sin " 1.3372986 rads" and how it compares to two long multiplications, a subtraction, and a division? but I'd still like to know how many steps are involved in your method for finding sin " 1.3372986 rads" and how it compares to two long multiplications, a subtraction, and a division? Well for calculating an individual sine a series method like yours is more efficient than a table, pretty obviously. However the OP seems somewhat confused since he has burned his log tables and jumped up and down on his calculator, but he has access to excel (pun intended). 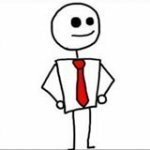 Setting that aside and assuming we are going back to the days when we either had a four function adding machine or even only long had pencil and paper a table comes into its own when we want to calculate lots of values of the function, since much of the work is used over and over again. One constructed at say 15 degree intervals Newton's divided difference procedure will get as many values as you like. The first polynomial has one subtraction, one addition and one long multiplication. Since you build up each polynomial result by adding to the previous the fourth polynomial will get you sine values roughly equivalent to Chambers seven figure tables for four extra multiplications over the third polynomial. If you have pen and paper (preferably math paper) then draw a polarized circle graph, sine is y and cosine is x. the values go from 0.1 to 1, protract the angle you wish to figure out for the sine, I.E when you have the opposite side and hypotenuse and the angle facing adjacent, whatever number from 0.1 to 1 the angle returns when drawing a straight line from the point where it meats the edge of circle (so a straight line across the x axis until it meets the y) is the number you multiply against opposite / hypotenuse. The o/h gives you your units, where the angle draws off on the y is the multiplyer. This is essentially the visual representation of the functions, all 3 can be mapped using a polarized circle graph, however i wish to know how this can be computated, is there specific logic that must be created in the ALU to do this kind of function? This was made using a bowl and knife so not accurate, but this is the process. But I don't see the point of the circle, you can do just as well by drawing a triangle if you have a protractor. If you don't have a protractor, but just have the angle drawn you can still get the sine but you won't know what the angle is then. Well d'you mean the external circle? or protracting the angle into the graph? you can use anything you want to get the angle into the graph but i would have presumed a protractor might be more precise and easy. Very simply, if you physically have the angle you can draw two lines at this angle. Then by dropping a perpendicular from on to the other and measuring with a ruler (as in Greek geometry) you can calculate the sine by division. 2) But you still don't have an accurate representation of the value of the angle itself, without a protractor. It is interesting as the ancient Greeks were able to divide linear measure very accurately but had no means of dividing circular measure to anything like the same accuracy. This capability came with and spurred on the industrial revolution and enabled many advances. Before numerical control of machine tools toolroom engineers (and apprentices) used a 'sine bar' to set out angles. If i said i wanted sine 22" theta how you gona get that onto the paper? i said "protract" as a method. Cheers for the reference, ill check it out.